Command Chief Master Sergeant William M Maginot was born on August 26th, 1944 in Reading Pennsylvania. He graduated from Abilene High School and received an Associates Degree in Electronics Systems Technology from the Community College of the Air Force. Chief Maginot enlisted into the 221st Radio Relay Squadron, Texas Air National Guard in 1966, where he would serve until transferring to the 254th Combat Communications Group in 1971. In 1985, Chief Maginot was appointed the Group Logistics Superintendent and during Joint Exercise Dynamic Guard, in Turkey, he engineered and led the installation of critical Army command and control voice and data circuits. Shortly thereafter, he was mobilized and deployed to Puerto Rico for Operation Restore/Uphold Democracy. 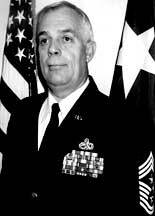 Chief Maginot was appointed the Command Chief Master Sergeant for Texas in January, 1988 a position where he advised the Adjutant General on matters concerning enlisted airmen and women. During this period he was appointed Regional Commander for the Air National Guard's Enlisted Field Advisory Council where he helped develop apprentice knowledge tests allowing personnel to use civilian education and skills to gain military skill levels. Innovative throughout his distinguished career, Chief Maginot led the development of the Texas Airman Leadership Seminar which prepared 130 Airmen for the Non-Commissioned Officer Corps, and would later be emulated by several other states. He ensured prestige and honor were restored to the Outstanding Airman of the Year Award by focusing command emphasis on the program. Additionally, he was a key player in instituting a grade enhancement program at the national level, resulting in thousands of promotions for airmen topped out in their career fields. Chief Maginot's irreproachable character, prestigious record and outstanding performance of duty reflect the highest credit upon himself his family, the state of Texas and the Air National Guard. A recipient of thirteen Federal and State military awards, Command Chief Master Sergeant Maginot served as the President of the National Guard Association of Texas from 1998-1999 and is a lifetime member of the organization. He retired from the Texas National Guard in 2001, after thirty five years of distinguished service to his state and nation.